Apples – this is probably the most popular fruit in Russia. Because of the abundance of exotics on the shelves, we sometimes forget about the use of domestic products. Sometimes it is useful to recall that the most useful fruits grown in the place of residence. And the merits of our apples, no less than we import fruits: they contain vitamins A, C and many essential trace elements: phosphorus, potassium, iron. When cooking stewed apples nutrients the majority are saved, and the time for boiling goes up quite a bit. For the compote you can use any fruit, even a bit spoiled. First, they should be well washed, then remove the rotten places, and then cut into slices. The pieces of removed seeds. Thus prepared, the apples are put in a pot and pour cold water. Proportions of ingredients can be very different, the classical variant – for 700 grams of apples will need a half liter of water and half a Cup of sugar. The pot is placed on fire and its contents brought to the boil, then add sugar. Boiling the compote you can cook for 10-20 minutes, but to preserve the vitamin it is best to remove the pan from the heat and let the compote just to steep for 20 minutes. You can wrap the pot. To diversify the taste of Apple compote will help any additives you can put in your drink when cooking the lemon zest or the rind of an orange, a little cinnamon or mint leaves. It is worth mentioning that the apples are perfectly combined with any other berries and fruit – raspberries, blueberries, strawberries, Aronia, pears, plums. To prepare compote of dried fruits (drying) we need 1 kilogram of dried apples, sugar 4 cups, water – 5 litres, lemon juice and 3-4 tablespoons of almonds. Before cooking dried fruits are washed, then filled with hot water in a pan add sugar and boil our compote is approximately 45 minutes. If in a dry compote contains not only apples, but other fruit, it should be remembered that cooked it longer just apples and pears, but because they are laid in the first place. Dried apricots are also cooked for a relatively short time – 15 minutes, and therefore add it to the compote should be for 15 minutes or until tender. The finished drink is cooled, then filtered and poured into glasses. Top added crushed almonds. Apples for domestic preparations are selected no damage, slightly unripe so they don't collapse when cooking. Too green the fruit will not have a pronounced flavor and aroma. In one Bank, laid the apples of one kind. The fruits are washed, if the shell is very dense, it is desirable to cut. Removed the core, and cut apples into wedges. If the apples are small (for example, Ranetki), they are used entirely. To make the compote turned out beautiful, and the apples not darkened, they are placed in acidulated or salted water, but they should be no more than an hour. Then, the prepared fruit should be blanched. If this is not done, then during sterilization compote of apples will decrease and the Bank will be more liquid than fruit. Blanch the fruit by placing them in a colander that is immersed for 7 minutes in a pot of boiling water. By the way, this water is then used to make a syrup. Pre-washed banks they are saturated with boiling water and laid them on the shoulders of the apples, then they are filled with syrup. The filling should not reach the edges of the cans 2 inches. Syrup prepared from the rate of a Cup of sugar per gallon of water. After the apples are stacked and filled with syrup, the jars need to be sterilized. Three-liter sterilized half an hour from the moment of boiling water, liter – 20 minutes. Then banks roll with metal lids and upside down, covered with a blanket, left to cool down. But there is a quick way of cooking compote of apples for the winter. In this case, sugar should be added to the syrup anymore – per liter of water – 300-350 grams. Apples also are placed on the shoulders of the banks and filled to the top with syrup. Kept filled for 5 minutes, then drained syrup in a saucepan and bring to a boil. The whole process is repeated again. On the third time the banks are filled with syrup so that part of it spilled over the edge. Then habitually rolled iron covers and turn over to cool. 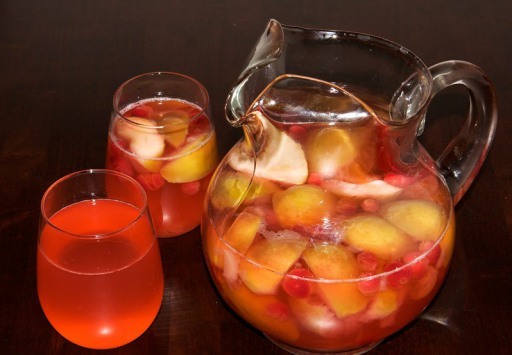 The Apple compote is not only a great thirst quencher, but also a medical product. Use it to treat kidney, stomach, liver and bladder. Drink it for anemia and gastritis. Shown Apple compote with weight lossbecause it contains just 85 calories and speeds up metabolism.